Copper Ridge is a unique professional development blending Traverse City access with over 55 acres of natural environment. A Planned Unit Development located at the western edge of Traverse City, Copper Ridge presents itself a rare opportunity for a professional office location, retail establishment, or residence. Dramatic views are available from a wide variety of elevations on this unique parcel. Located by the historic Grand Traverse Commons property, Copper Ridge is just 5 minutes from Downtown and Munson Medical Center. Please explore this web site and see why this is a golden opportunity in Traverse City. New! Copper Ridge Business Directory New! 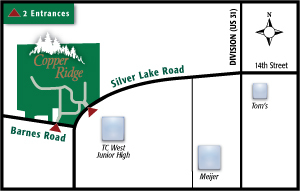 The development is located at Silver Lake Road & Barnes Road (across the street from Traverse City West Junior High School). Click map for a larger version. A new traffic signal has been installed at our main entrance on Silver Lake Road. This light operates as one light with the traffic light at Barnes & Silver Lake. Also, a new entrance into Copper Ridge has been constructed off of Barnes Road. ©2017 Copper Ridge, LLC All rights reserved.